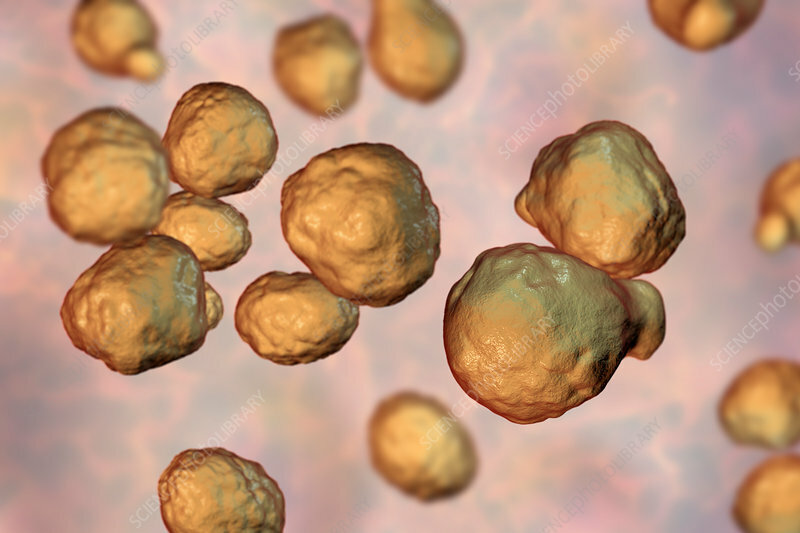 Cryptococcus neoformans fungus, computer illustration. C. neoformans is a yeast-like fungus that reproduces by budding. An acidic mucopolysaccharide capsule completely encloses the fungus. It can cause the disease cryptococcosis, especially in immune deficient patients, such as those with HIV AIDS (acquired immunodeficiency syndrome). The infection may cause meningitis, and may also be located in the lungs, skin or other body regions. The most common clinical form is meningoencephalitis. It is caused by inhaling the fungus found in soil that has been contaminated by pigeon droppings.